We now have the 2016 regatta calendar and are taking bookings and holding 2015 prices for bookings taken by 1st November 2015. Yachting World Rnd. Antigua Sat Apr 23rd. Les Voiles de St.Barth 12th – 18th April : just 2 places left on board a Beneteau 40.7 to experience this exciting regatta now in its 6th year. Come for the regatta, turquoise waters, wonderful sailing conditions and fall in love with this picture perfect island. JC started it all. “I want to do the Caribbean 600 for my 50th birthday”. He is a regular Wild Spirit race team member with Fastnets and Round Ireland’s with us so I thought about it. The logical step was to do it on another yacht in 2014 before putting a package together; along came a 55 foot classic Swan wanting a watch leader/ safety officer, so off I went. Then having selflessly spent 10 days in the Caribbean racing plus researching, we put together a package with On Deck for 65 footer, Spirit of Juno a former Round the World racing yacht. Why such a big beast? Quite simple really, most of the team think they will only do one C600 so, as in the Sydney Hobart, we go for a yacht with the highest probability of finishing if the weather gets bad. The other thing is to find people who can make things happen in the notoriously laid back culture of the Caribbean and On Deck can do this as they are there all year round, whereas the rest are just passing trade. This might seem a small thing but when you need a sail repairing the day before the race it really matters. Having ‘done the deal’ with On Deck dates were important as the Virgin Flights on Tuesday’s were cheaper than the rest, so 2 weeks it was, and then of course the WAGS decided they would come and have a holiday. So as I type this I overlook the Pool and across the Bay towards Juno as she lies alongside next to the Yacht Club where the superb prize giving party was held last night. Arriving from a cold, wet UK to 27C of Antiguan sunshine is always a pleasant start and those staying on board went to Juno, whilst I did some shopping, followed by trying to find where I was staying, in a remote house, on a very dark Island, with extremely limited road signs. On Deck had sent a Mini Bus for the on-boarders and I think next year I will be on it even if I then pick up the Hire Car by the boat. Wednesday morning was handover and in the afternoon we started training. This was the first time I had sailed a Farr 65 and was immediately impressed by how easily she handled. The team were impressed by the on board accommodation which was really good for our limit of 16. The wind blew steadily from the East at 20 Kts and we tried the Genoas and main, practiced tacking etc but only really had the opportunity to fly the kite once. The second new kite stayed in its bag though we did wool it up before the start. By the time we finished training on Saturday the wind was still 20 kts and forecast for 25 at the start on Monday. Great for us and we enjoyed the party on Saturday night. Sunday had very sensibly been scheduled as a rest and recovery day. The C600 is less than 10 years old but at the current rate of growth it will probably be bigger than the Sydney Hobart in 5 years’ time. The start is under Shirley Heights with its commanding view of the entrance to Nelson’s dockyard. The sun shone, the wind blew and the helicopter hovered overhead taking pictures. 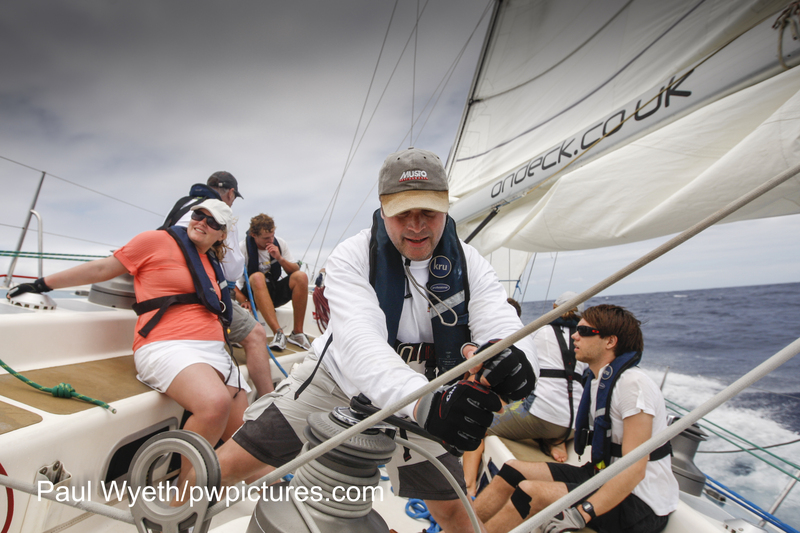 We crossed the line at 10 kts almost taking out a spectator boat before tacking onto the first leg North past Barbuda. Juno handled beautifully in the big swell and the team settled into their roles. We rounded the mark and set off on a downwind leg putting up a kite; for a while all was well, but in the dark the kite blew and when we hoisted the new A2 kite the tack was 3 metres above the Bowsprit. This meant we could not have spiked the Tack easily in a Squall and there were plenty about so we were back on to the Genoa. The C600 is renowned for its spectacular scenery including the active Volcano on Montserrat, it is all known for its multiple changes of course and in particular the problem of coping with the wind shadow off Guadeloupe. We gambled and went inshore and successfully fought our way through a few wind holes with Kathy trimming the Genoa expertly whilst Oli Navigated. We had lost ground in the leg South of St Maartens but once we rounded the Iles des Saintes we had a great run in over 20 kts as we beat North East again. At one point we were hit by one of the wettest squalls I have ever encountered which effectively washed me and my clothes. Normally you dry quickly after a Squall but this called for my one set of dry spare clothes. Back past Antigua we sped North up to the Barbuda Mark and then had a great run down to Rotonda, known as Rat Island, overtaking Scarlet Oyster and EHO 1. Rounding Rat Island is always tricky due to wind shifts plus an off lying rock and we were more cautious than the other 2 yachts, so they were level with us again for the long beat back to the finish line. Now it was close and in the dark we tacked back and forth before crossing the line just behind Scarlet Oyster and just in front of EHO1. Then it was JCs 50th birthday and party time, as we arrived back alongside the Beer. Bubbly and Rum Punch came aboard; the next bit is blurred but we managed the prize giving party on Friday night and collected our Trophy, before most of the team partied on into the night. We crossed the line 24th out of 68 entrants, saw a Whale, a Turtle, Flying Fish plus numerous Dolphins, made lots of friends and had a great time. I am skippering Spirit of Juno again for next year and we already have some repeat bookings. The only problem I now have is convincing my wife I really was working. JC and his 50th Birthday cake on the last day of the race. Bridgetown, Barbados (30, September 2014): Race teams planning next season’s calendar could do worse than sign up for the Mount Gay Round Barbados Race Series 2015 which runs from 16-24 January. This event, which kick starts the Caribbean race season, was re-launched in 2014 with a new race format and plenty of record-breaking opportunities. It proved such a success that an even bigger entry is expected in 2015. Organised by the Barbados Cruising Club in association with the Barbados Tourism Authority and Mount Gay, the Mount Gay Round Barbados Race Series encompasses the already established Mount Gay Round Barbados Race plus a series of coastal races, and a final 300-mile sprint to Antigua to tie up with the Superyacht Challenge. The Mount Gay Round Barbados Race Series is one of the most appealing events on the circuit, attracting race teams keen to use the event as a warm up for the Caribbean season. One of the biggest draws, other than the warm Caribbean waters, miles of gold sandy beaches, and constant 12-18 knot east to east-north-east trade winds, is the opportunity to break records. The headline event is the 60-nautical mile Mount Gay Round Barbados Race on Wednesday 21 January in which teams race to break and set Round Barbados Records. There are currently 14 established records, all of which offer the skipper’s weight in Mount Gay extra Old Rum if broken. Other big boat teams already lined up for the 2015 event include two VO60s – Cuba Libre and Spirit of Adventure, two TP52s including BOSS and Baleria, the Farr 65 Spirit of Juno, and Ralph Johnson’s Beneteau 53 Rapajam – overall winner of Racing Class 2014. It is also hoped that the 55m racing schooner – Elena – will take part in the Classic fleet. For teams looking for competitive one-design racing the Mount Gay Round Barbados Race Series has plenty to offer with a chance to race among the super competitive local J/24 fleet. This sort of short-format regatta is ideal for this highly exciting class. The 2014 event attracted a fleet of 10 boats but going by the local class enthusiasm, and the standard of competition, it is hoped there will be more overseas entries at the 2015 event. Although there are several local boats available for charter, the organisers are keen enhance the number of entries by offering a special shipping package deal for teams from the UK. As well as the healthy fleet of J/24s, interest is building among other smaller classes, multihulls and windsurfers, who find the record-breaking challenge round Barbados too exciting to miss. Charles Hunt, who set a new windsurfer record in 2014 with a time of 7 hours, 59 minutes 10 seconds, will be joined by at least one other – Fabi Cornic. As expected at the home of Mount Gay Rum, fine Caribbean hospitality will be in full flow throughout the week with a party every night including the legendary Mount Gay Red Cap party. Following the success of the lay day activities in 2014, the organisers have lined-up another Barbados Polo Club exhibition match, and a visit to Mount Gay Distilleries in Brandon. The first recorded race round Barbados was in 1936 when five trading schooners (Sea Fox, Mona Marie, Marion B Wolfe, Lucille Smith and Rhode Island) took up the challenge. Sea Fox (Captain Lou Kenedy) was the overall winner with a time of 10 hours 20 minutes. The original race was based upon bragging rights for the fastest Trading Schooner. In an era where prices for cargo arriving ahead of rival ships commanded a massive premium, this was a lucrative race for captains. The consolation prize of a barrel of Mount Gay Rum for the slowest yacht was discontinued several years later following the discovery that some competitors purposely stalled and remained out at sea for days to ensure they won the prize. In 2012 The Mount Gay Round Barbados Race expanded to incorporate the Two Restaurants Race, which meant racing took place over two days. The idea proved such a success, it was decided to expand the event further in 2014, in line with most other Caribbean regattas, and run a series of coastal, round-the-buoy races including the Two Restaurants Race, and The Mount Gay Round Barbados Race. The 300-mile Ocean Race from Barbados to Antigua at the end of the regatta was specifically designed to tie in with the start of the Superyacht Challenge in Antigua. The Regatta season has got underway with the first major event of the season in Barbados. The traditional Mount Gay Round Barbados Race has evolved into a series of 3 inshore race days followed by the big event itself [always on the 21st Jan], some more parties followed by the inaugural 300 nm Barbados to Antigua Race; oh and of course some more parties.